Truly Tina's full on energy, sweat and powerful voice will have you standing and dancing in the aisles. Close your eyes and you'll swear its Tina Turner. Open your eyes, the unmistakable legs, muscular body and you'll know it can only be "Truly Tina".. with the big hair, all the energy of the 70s and 80s, wild and provocative costumes and of course Tina Turner's hit songs like Proud Mary and Private Dancer. The stage will come alive with electricity. 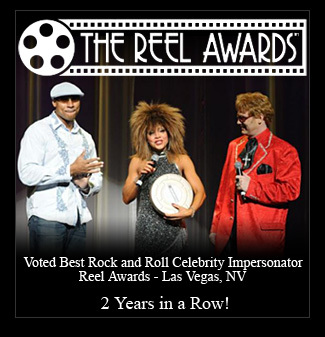 Samira travels the world and is rated one of the top "Tina Turner" tribute Impersonator in the look-a-like industry. In fact, Samira was invited to perform in Ms. Turner's former high school for the official opening of her museum on September 27th, 2014! Other performances include Australia, China, Guam, Mexico, Vegas and the Middle East for the troops and companies such as Mcdonalds, Phillips, Siemens, The Oilman of N. America, and Subway just to name a few. Samira was honored to perform in "Great Hall Of The People" next to Tiananmen Square at such a magnificent venue (see photos). Samira also speaks fluent Arabic which was helpful with her tour of the Middle East. Her love of the "Queen of Rock N Roll" has given her the drive to follow and reproduce every nuance of Tina Turner. This is why Samira is sought after as one of the leading Tina Turner tribute look-like impersonators world wide. Tina Turner's torrid vocal interpretation and electrifying stage presence has always been an inspiration to Tina Turner Impersonator "Samira" who has managed to take the wonders of Tina Turner and replicate them with amazing energy and passion! Samira is a fan as well as a Tina Turner Tribute and is dedicated to portraying her favorite legend with absolute accuracy. Samira's especially influenced by Tina Turners infallible ability to drench a lyric in passion and then whip it into a hurricane of choreography and vocal deliverance that one would think would be impossible to duplicate. Her rendition of the Queen of Rock and Roll is unrivalled. (See Video) Her legs are the best in the industry and the closest to Tina Turner that you can get. Samira is a fitness instructor and athlete and works hard to to keep those "nut cracking thighs and muscular body that she hopes would make Tina Turner proud. During a performance in Knoxville Tennessee, Samira had the opportunity to visit Tina Turners home town of Nutbush Tennessee and was overwhelmed by the love the people have for Tina Turner. Samira has an intense passion for her music and strives to take her tribute of her favorite artist to venues all over the world . . . across every River Deep and over every Mountain High! Copyright © 2011-2014 Samira Truly Tina | All Rights Reserved.